The Valentine Essentials Tour has been going strong and today I’m excited to share with you what I sewed for myself for a little something special for Valentine’s (and every) Day! Some of this links in this post are affiliate links, but all opinions are mine. I realized over Christmas Break that all of my camis and tanks were wearing out and that they were all from back before Bean was even born. Since she’s five now I think it’s time to make a few new basics and the Everyday Essentials (*affiliate link) pattern from EYMM is perfect for that. I made the cami in a basic black for layering and love how it came out. I will definitely make more in other colors. The best part about the pattern is the cup sizing for the crossover portion to really get the fit you personally need for a sleep bra, nightgown, or cami. I didn’t line the cami as I knew I’d be wearing a bra under it, but there are instructions for lining the bust for more support included. I made a size L with the Full cup size according to my measurements and this is one of the few times where even with a knit garment I didn’t need an FBA. That is a huge tell for how well this pattern is designed. I made a muslin (this is a quick sew) last week and the fit was spot on, but my bra was just showing slightly above the crossover. I prefer full coverage bras so this is just a personal preference, but since the crossover front can be modified to be more or less modest depending on how you’d like it I took advantage and slid mine over about 1.5″ for the final version. The V is still deep enough, but not so deep that my bra was showing. Easiest bust adjustment ever. The back has really nice coverage which helps support the front. That’s important if you’re making the nightgown or a sleep bra as you don’t want everything shifting around on you. It’s also how I prefer my layering camis to be. You can see in the above pic the stretch lace that I used around the neckline. It was super windy when I was trying to get pics outside so the lace was flapping in the wind in all the outdoor pics. The pattern includes directions for using stretch lace, knit binding, or fold over elastic which is what I used on the armscyes. I love my new cami and think it’s just right for layering for a date night or a special event like Valentine’s Day. The lace gives it a little bit of a dressed up feel, but really the Everyday Essentials (*affiliate link) pattern is perfect for just an everyday look as well. See the info below about the tour discount! During the tour, the Everyday Essentials pattern is on sale for half off! 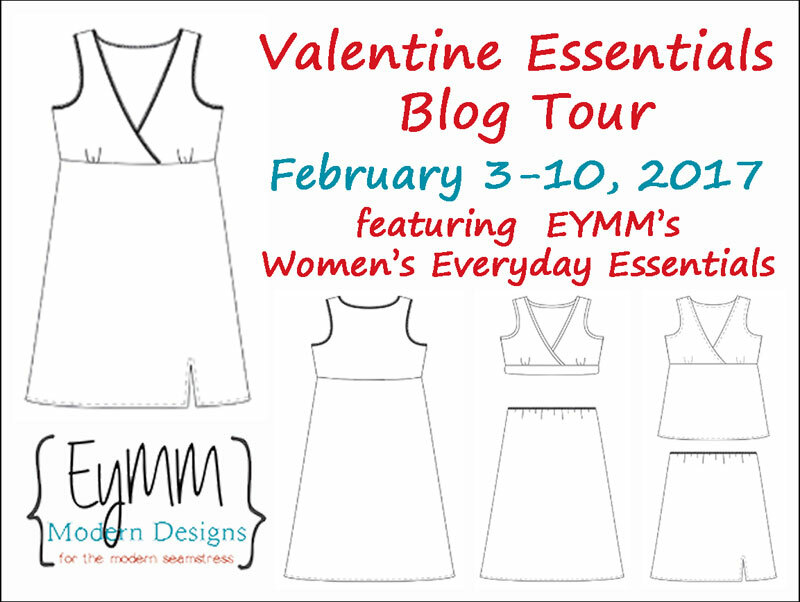 Use code VDAYTOUR on the EYMM site (*affiliate link) to save 50% on the Women’s Everyday Essentials (*affiliate link) pattern until February 12 at 11:59pm PST. I love the lace you used on your neckline! Thanks for joining in the tour! This is gorgeoys Ajaire. I love it as a layering piece. Thank you! I was desperately in need of some new camis! I love the edging on your top! I “accidentally” made an outerwear version last year, but it never occurred to me to make it a staple. I will defnitely try that. Great job! !